That she is no stranger to our own personal problems is good reason to read about this strong woman. 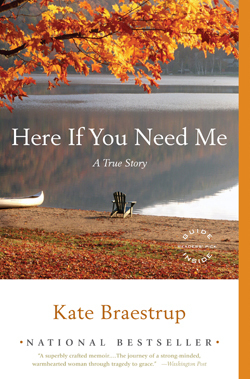 Here if You Need Me is a memoir by Kate Braestrup, a chaplain for the Maine Warden Service. Married to a state trooper who planned to enter seminary after retirement, she was grief-stricken at his death in an accident. In her grief, she not only bathes and dresses his body for burial before cremation, shocking the funeral directors by doing so, but decides to go to seminary. Within a year, she begins study at Bangor Theological Seminary to become a Unitarian Universalist minister. This book is not only a book about a young mother with four children coping with grief, it also is a theological treatise that gives great comfort and hope and serves as a guide for those of us in pastoral care. For the active reader, there are brief discussions of various books and wonderful quotes from writers we want to know. There are search and rescue mishaps that end happily and ones that sometimes end sadly. Included is an abundance of nature, with descriptions that make your heart sing, as well as those that will chill you to the bone; stories of game wardens who are hurting in their own sadness and conflicts; and the chaplain’s pastoral counseling that includes the importance of love and the community. This wonderful book that you will cherish is complete with a Reading Group Guide. Altar guild women know about chaplains, especially those of the Armed Service and Prison Ministries, and, of course, hospital chaplains, but this book deals with game wardens’ services. And what a delight it is, not only for the beauty that is Maine but for the services provided the state’s people “through education, community involvement, professional law enforcement, search and rescue practices…while conserving Maine’s fish, wildlife, and other natural resources.” You’ll want to go to Maine just to meet this group. And for those of us who want to believe that after great sorrow comes great happiness, there is that as well, although Braestrup says that she cannot make “those two realities — what I’ve lost and what I’ve found — fit together in some tidy pattern of divine causality….I hold them on the one hand and on the other, just like that.” Good advice from one who knows.